With a steady sway punctuated by the rumble of old tracks and enunciated, every so often, by the long blow of the conductor’s whistle, the locomotive tugs deeper into the Monongahela National Forest. The pace is neither too fast nor too slow; it’s perfect for a lazy summer afternoon of gazing across rolling landscapes filled with every shade of green. Up a hill, along a river bed and further higher in elevation you’re carried, with a sweet breeze whipping through your hair, drying the sweat that beads so easily in the snug embrace of a West Virginia summer. For the young and young-at-heart alike, Durbin and Greenbrier Valley Railroad’s Mountain Rail Adventures is a sure escape from the hustle and bustle of daily life, offering the chance to sit back and do nothing but be present in moments of incredible natural beauty. With a number of options fitting all budgets and itineraries, the railroad offers a bit of something for everyone. And the trains are simply your first stops on a weekend of exploration that melds history with contemporary arts, relaxation with adventure and culture with breathtaking scenery. Which rail will you ride? With nine trains to choose from April through December, it’s easy to customize your trip by mixing and matching train rides to fit your ideal West Virginia vacation—especially for overnight or extended vacations. Simply book your tickets and let the trains lead you through West Virginia’s backcountry. 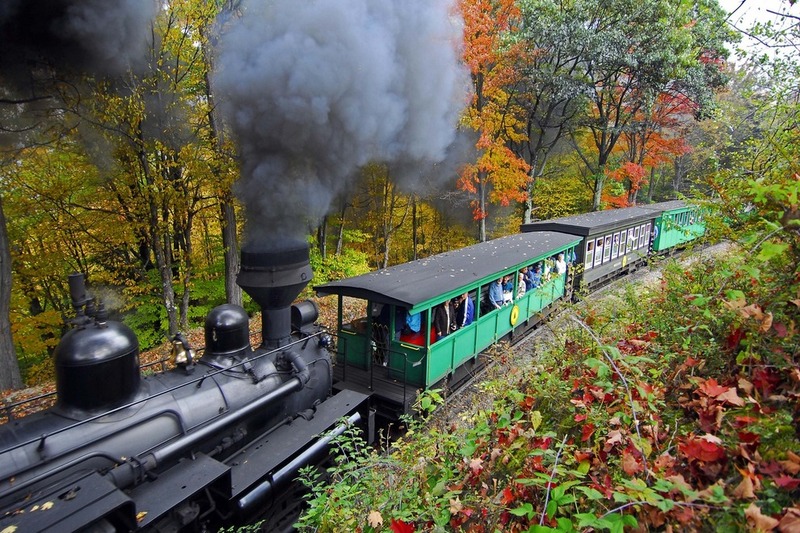 Families big and small will love the Cass Scenic Railroad adventure departing from West Virginia’s historic logging company town of Cass. The two-hour ride aboard a beautifully refurbished 20th-century Shay locomotive is the most popular of the railroad’s options, and it’s easy to see why: The historic and picturesque trains carry passengers through vibrant West Virginia countryside to Whittaker Station, a beloved display of the Appalachian logging industry with an unparalleled view of Cass Scenic Railroad State Park. A two-hour extension to the trip takes passengers even farther—up to the peak of Bald Knob, one of the highest points in the Allegheny Mountains. The truly adventurous can turn this ride into an overnighter by booking a stay in a rustic caboose at the top of Bald Knob. For those preferring climate-controlled relaxation, the New Tygart Flyer offers stunning views of steep mountain grades, curving tunnels and dense forests. After departing from the mountain epicenter of Elkins and crossing bridges and the Cheat River, passengers stop at the High Falls of Cheat to take in the sights and sounds of a 150-foot waterfall high in the West Virginia hills. But wait folks, there are still more adventures to mix, match and experience. The Cheat Mountain Salamander takes passengers to the inaccessible-except-by-rail historic town of Spruce. Then there is the Durbin Rocket, which is pulled by one of the world’s three operating Climax locomotives. Plus a dinner train, The Polar Express™ and more! Can’t pick one trip over the other? 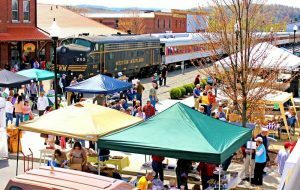 Recently, the Durbin and Greenbrier Valley Railroad has begun offering customizable overnight packages in Elkins and Cass that combine two train trips onto one ticket. Start in Elkins and overnight in Cass, or start in Cass and spend an evening in Elkins. The choice is yours. At this point, you might be asking where you should begin your rail adventure. The choice can be made easier once you know what it is you would like to see and do. Might we suggest taking the time to discover this West Virginia gem: The mountain town of Elkins, one of the most vibrant communities in the state. Elkins developed in the late 19th and early 20th centuries around rail and industry. But in the 21st century, this town grabbed ahold of its roots, intertwining history with culture, to become an arts center in West Virginia. Elkins is the home of Davis & Elkins College (D&E), the Mountain State Forest Festival, the Augusta Heritage Festival, museums, heritage crafts, music, dining and much more. If you’re around in July and August, check out the Augusta Heritage Center’s itinerary of summertime music and craft events. The annual Augusta Heritage Festival brings musicians from all over the world for craft and companionship, and impromptu jam sessions are known to dot the D&E campus throughout the festival. A summer concert series also takes place every Tuesday and Thursday from mid-July to mid-August. After a ride on the railroad, perhaps on the Cass Scenic with a transfer to Elkins via the Cheat Mountain Salamander, visit the Railyard Restaurant for a bit of comfort food and the Greatest Show on Rails, a live musical performance depicting a journey by rail. Couples will love evenings out at one of the town’s many favorite watering holes like Beander’s Restaurant & Tavern and The Jabberwock Bar & Grill. Other favorite Elkins dining establishments include El Gran Sabor—a casual Venezuelan restaurant—and the 1863 Grill—a family chophouse. Wherever you decide to go, make sure to check out the libations of the local Big Timber Brewing. After a full day, it’s time to rest your head at one of Elkins top-rated lodging options (unless you decided to escape from the world in the caboose). Mountain Rail Adventures will customize packages based on mobility needs and location preferences. If you’ve chosen to ride the rails from Cass to Elkins to stay the night, it’s important to remember your stay in Elkins will take place on foot. For weekends in Elkins, The Forks Inn is a great choice, located at the edge of town with a B&B feel in quiet natural wonder. If modern luxury is more your style, you might enjoy the Isaac Jackson Hotel, in the heart of Elkins, where comfort mixes with the amenities of modern lodging. After a full night’s rest, the rail will return you to your starting point and vehicle, where you’ll be left feeling refreshed and satisfied you came, saw and experienced West Virginia. Begin planning your rail adventure.